Hang on and Enjoy the Ride! Wow! What happened to January? This year is FLYING by already, which is why I felt it was “time” to write this blog post. I put “time” in quotes, because the concept of linear time is changing, evolving, stretching, and shrinking — all based on our own perceptions. Now, some of you might argue — the clock still ticks one second at a time. I get it. I hear you. But have you ever been so involved in a creative project for HOURS when it felt like only minutes had gone by? Or my favorite is when I’m on deadline and I’m able to write pages of material in what I swear is a time warp. I have no idea why or how, but I’m able to actually slow time down in order to meet my deadline. In numerology, 2012 is a “5” year. You get this number by adding up the 2+0+1+2. What does this mean, you ask? It means: Hang on! 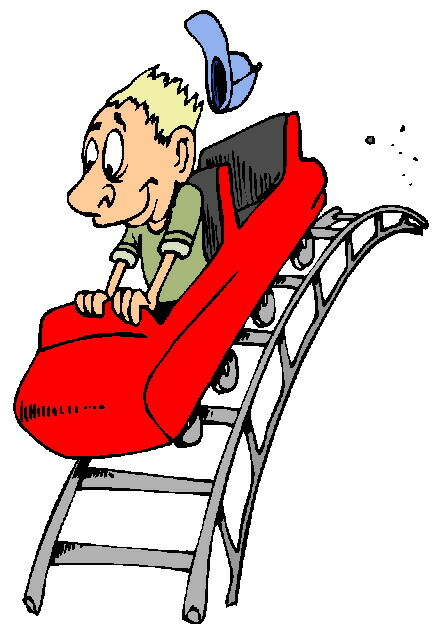 This year’s going to be a roller coaster ride! As many of us have already experienced, and it’s only January, the nature of a 5 year is fast, furious and ever-changing. That doesn’t just mean “big changes.” It also means — little changes — daily. For example, if you make a plan for the day, BE FLEXIBLE. Times, places, dates, ANYTHING can change at the last minute, forcing us to learn flexibility, patience and the ability to go with that flow. A lot of people do not like change. So this can pose quite a challenge. But I’m suggesting that this year, you will have to embrace change. And clinging to the way things used to be or what seemed to “work” in the past, will only make it more challenging for you in a 5 year. Remember, it’s not the actual change that’s painful — it’s the RESISTANCE to the change. Be open to new and wonderful things coming into your life. Trust that it’s for your highest good if that meeting is canceled or you’re forced to move out of your apartment at the last minute, or even if you lose a job. Ask your angels for strength, patience and grace during any time of challenge. And most importantly: nurture yourself. Be loving, kind, forgiving and compassionate to yourself and others. Because of the “speed” of a 5 year, it’s also important to stay on task. If you don’t take small steps every day towards a goal, it’s very easy to look at the calendar and find that days or even months have gone by without any progress. Set your intentions and create small steps to achieve your goals and do your best to stick to your commitments. Otherwise, you might find yourself in December wondering what happened to the year. Which you’ll probably do anyway — but it’d be nice to actually have something tangible to show for the year. Now back to the “concept” of time. This would be a great year to work with how you relate to linear time. I know that probably sounds odd, but if you start paying attention to time, you’ll begin to see trends of how it “speeds up” and “slows down” depending on what you are doing or how you are feeling. Are you always feeling that you don’t have enough time to do everything? Do you always think you’re going to be late for or even miss out on an event? These beliefs create anxiety or fear which are negative emotions. You’re actually projecting out into the future a “negative” situation that you don’t want to happen. One way to shift this energy is to “believe” and act as if you DO have enough time. This will relax you and, believe it or not, SLOW time down, in turn creating a more positive experience. Here’s an example of how this worked for me recently. I had planned a trip to Vegas for my birthday last weekend. Or, I should say, my boyfriend planned it. Our flight was delayed by 45 minutes making it almost impossible for us to make our dinner reservation. Wanting everything to be perfect for my birthday, my boyfriend was starting to get a little stressed out. I remained FLEXIBLE saying, if we miss the reservation, we’ll find another place to eat. (Yes, something I practice what a preach!) But inside, I just ACTED AS IF everything was going according to plan. I BELIEVED we had plenty of “time” to get to our reservation and to the show afterwards. The flight ended up taking off an hour late. And after we stood in a REALLY long line to get a taxi, waited for a chatty woman to check us into our room, and picked up our show tickets at Will Call, we STILL easily managed to make our dinner reservation ON TIME. How this all happened, I have no idea. It doesn’t make sense logistically. All I can say is that I remained flexible, believed we had enough time and trusted that everything would go according to plan. And it did! I love your example. That happens to me all the time and I am nearly always on time!